“One in five Tanzanian girls has already given birth,” Irene Lukumay pauses, peering up at the 30 health ministers seated in front of her. Presenting for any group gives Irene the jitters. But for the young designer, asking Tanzania’s Ministry of Health to support Adolescents 360 (A360)’s work—well, the stakes were high. Irene is one of more than 260 youth partners that has joined A360, an adolescent and youth sexual and reproductive health (AYSRH) project to reimagine how girls aged 15-19 access contraceptives across developing countries. She, like the dozens of young designers at A360’s core, is at the frontline in revolutionizing how public health practitioners listen to and work with youth to transform the family planning programs of yesteryear. Globally, some 16 million adolescent girls will give birth this year. In Africa alone, an estimated 2.1 million women and girls will experience an unintended pregnancy, a quarter of whom will undergo an unsafe abortion. The need for expanded reproductive health services remains an undisputed priority. Irene has a plan, and with it a voice to break the barriers blocking girls like her from accessing their right to modern contraception. A360, she says, is delivering a solution. A manifesto for an AYSRH revolution. Adolescent girls participate in Kuwa Mjanja, A360 Tanzania’s AYSRH programming. Kuwa Mjanja blends contraceptive and life-coaching services for urban and peri-urban Tanzanian girls, with and without children. With programming offered in delightfully branded pop-up outreach events and public and private health clinics, Kuwa Mjanja creates a space for girls to feel special and part of something bigger than just themselves. A revolution is not an apple that falls when its ripe. It’s a movement that begins with a spark and swells to crescendo. Shifts in thought ignite a change in delivery. AYSRH approaches over the past three decades have chipped away at the issue, but have failed to deliver change at scale. And with the youth population exploding, what got us here won’t get us to where we need to be. Adult -driven research and decisions. Graphs. PowerPoints. While traditional modes of research and programming yield meaningful data, the numbers, reports, and directives produced can lack the empathetic ingredient we believe is central to designing resonant health solutions. Girls across Nigeria face deep cultural and societal challenges in accessing contraceptives. A360’s 9ja Girls programming works within the complexity of this system to meet girls, and their influencers, where they are and how they need. A360 is a trial by fire. Through a Human Centered Design (HCD) approach enhanced by developmental science, social anthropology, marketing and public health, young designers like Irene serve as decision-making members of A360’s motley crew of researchers. 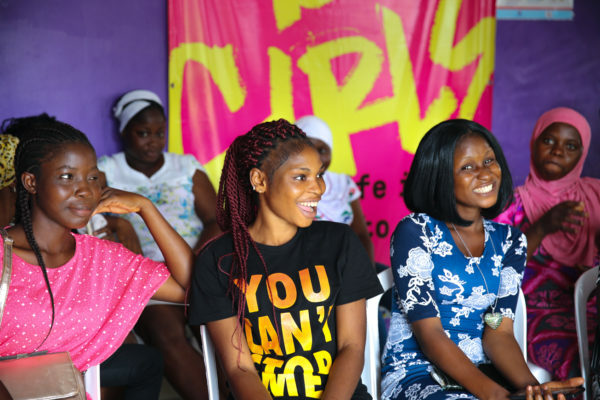 At every turn of A360’s innovation gears, youth feed their perspectives on the unique cultural, religious, and societal experiences shaping how girls—and their influencers—perceive contraceptives and the world around them. HCD empowers programmers to work hand in hand with a project’s audience, igniting a new way of listening with respect and observing with curiosity instead of judgement. It flips the standard practice of designing and pretesting by embracing the fresh perspective of end-users’ lived experiences at every turn. The process brings back what the boardroom air conditioners have too long drowned out: the emotional connection to a body of evidence. In Ethiopia, A360’s Smart Start uses financial planning as an entry point to engage young married couples in planning their futures, positioning contraception as a tool to achieve their goals. Through A360’s research and discovery phase, girls told A360 that they viewed contraception as irrelevant, probably harmful, and at odds with their dreams of motherhood. These insights fueled A360’s blueprint for change: delivering AYSRH solutions that use immediate goal-setting as an entry point to deliver reproductive health services. In Ethiopia, A360 uses financial planning to initiate contraceptive counseling with rural, married girls. In Tanzania A360 offers urban and peri-urban girls a mini life coaching interaction that leads to opt-out private sessions with providers—about anything a girl wishes to discuss. In Nigeria, A360 delivers vocational training that feeds into contraceptive counseling. Across all three countries, A360 programming is driven by girls’ insights and frames contraceptives to address their immediate needs: confusion about how to practically achieve a better life, desire for financial independence, and a quest for identity. HCD is a problem-solving tool that drives responsive solutions. For A360, it’s provided a revolutionary approach that is catalyzing rapid change: adoption of a contraceptive method through a single, brief contact. “People think adolescents don’t know about the world,” says Genet Ebuy, a 25-year-old with thick strands of ebony hair pulled back into a low ponytail. Ebuy has worked as an A360 Ethiopia young designer for just over a year. Across A360 Ethiopia’s target region, more than 580 thousand girls aged 15-19 do not want to get pregnant. Yet at the start of Ebuy’s work, 228 thousand girls did not have access to a modern contraceptive method. In Ethiopia, the cultural imperative for girls to prove their fertility after marriage is strong. But through HCD, girls told A360 that they want their children to have better quality lives—yet they felt anxious about their futures as the country shifts to a cash-based economy. A smaller family, they said, could offer a way to reach their life goals. The insights spurred A360’s development of Smart Start, a tool that approaches contraceptive counseling from a financial planning lens. Through Smart Start’s “Baby Calculator,” girls and their husbands map out the cost of a child in contextually relevant terms (e.g., a sack of grains). The calculator, developed in partnership with young designers like Ebuy, supports couples in understanding the cost benefit of delaying pregnancy. The Smart Start intervention, implemented in partnership with the Ethiopian government’s community health extension worker system, is seeing that some two in five of girls who aren’t already pregnant or using a contraceptive are take up a method during the Smart Start session. One in two married girls who engages with Smart Start leaves with contraception. Most are choosing long acting methods, like implants. Half who take up a method do not already have a child. Genet Ebuy’s voice, alongside A360’s 260+ young designers, is at the center of how A360 drives youth-powered sexual and reproductive health breakthrough. What people say they desire, is not always what they want. “All people, adolescents included, are poor predictors of their needs,” says Ahna Suleiman. Suleiman is a research scientist at UC Berkeley’s Center on the Developing Adolescent, and a core partner in A360’s research team of unlikely actors. Girls, for example, told A360 Tanzania that they wanted private contraceptive counseling. Yet when offered a one-on-one meeting at a clinic, our design teams found that only one girl in her group of friends would opt-in. The rest would leave once the girl returned. In follow up interviews, girls expressed hesitancy to engage in counseling due to the cultural stigma surrounding contraception. Why attend? Although they were curious, they could get the highlights from their friend. A360 Tanzania went back to the drawing board, swapping opt-in for opt-out private counseling. The adaptation removed the friction girls were experiencing from stigma by making it the norm for every girl to engage, unless she chose not to. In Tanzania, there are 2.3 million girls aged 15-19. More than half of the girls are sexually active, but three in five do not have access to a family planning method. Of those who do you use contraception, only three in 10 resort to a modern method. “Accounting for context is critical to understand the key inflection points for different adolescent populations,” says Suleiman. “Youth-centered solutions must create a space for positive risk taking that hones in on adolescents’ natural motivation for exploration, status seeking, and autonomy.” Suleiman sees these elements woven into the A360 blueprint. Today, approximately one in two girls who attends A360 Tanzania programming takes up a voluntary, modern contraceptive that day. Sometimes the smallest change sparks the biggest impact. In the two years since its launch, and a mere nine months since the project’s early pilot in a handful of sites, A360 has reached some 13 thousand girls with modern contraception, with the numbers climbing every day. A360 proves that solutions work when adolescent voices are injected into the design, delivery, implementation, and evaluation of reproductive health services. It’s a formula to revolutionize how adolescents access contraceptives in Africa, and beyond. “A360 has always been about involving girls, about understanding them, and about bringing them in,” says Lukumay. The Tanzanian young designer served as A360’s advocacy coordinator: the youth voice in the project’s government outreach.